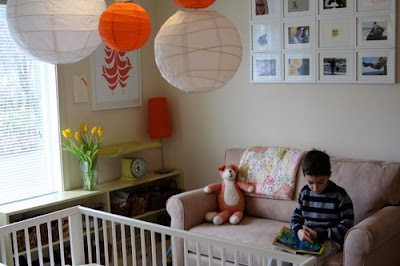 I am loving this nursery put together by Ali Edwards. It is the perfect mix of new and old. I love it too! Love the orange lanterns, very cool room! Now, THAT is a practical nursery. I love that it's not all pastel and "babyish." This looks like a room that can "grow" with a kid and I really appreciate that.